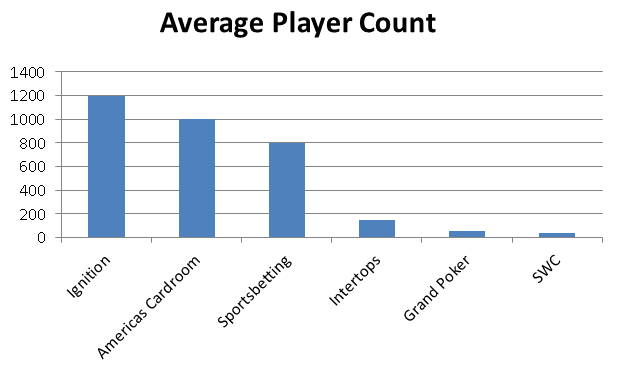 What are the largest poker sites available to US poker players? In this article, we rank the size of offshore poker sites that allow US players by both cash game volume and tournament offerings. The largest poker sites in the world are often not available to US players. Ever since Black Friday forced some of the largest poker sites in the world to pull out of the US markets, players have thought their options limited to only a couple small, offshore poker sites. However, players might be surprised to learn that there are two USA offshore poker networks that are among the top ten largest networks in the world. There are also a number of big sites that offer games to Americans that are in the top 25 largest sites available. So while PokerStars and 888 poker are not available, there are still plenty of high-quality, high-liquidity, and fast-paying online poker sites available to play on. For American players, there are two main options when it comes to playing online tournaments, both of which are among the top 10 largest poker sites in the world. The two biggest options are hosted on the Pai Wang Luo poker network and the Winning Poker Network. Each of these networks hosts upwards of $5 million dollars per month in guaranteed tournaments! It's tough to call a winner as each network has pros and cons. For example, one caters more to small-stakes players and the other caters more to higher buy-in grinders. The Pai Wang Luo network's US-friendly partner is called Ignition Poker. Ignition offers tournaments with buy-ins ranging from $0.25 all the way up to $540. Tournament types include both Holdem and Omaha variants. The largest weekly scheduled event is a $100,000 guaranteed NLHE tournament on Sundays, with tons of satellites each week to earn your chance to play. This network has more tournaments for low stakes players, and better guarantees on those tournaments. It also has the distinction of having the weakest players on all sites! The Winning Poker Network has a number of US-friendly brands, including America's Cardroom, Black Chip Poker, and True Poker. These card rooms offer buy-ins ranging from $1.10 all the way up into the thousands of dollars. Tournaments come in both Holdem and Omaha flavors. The largest weekly scheduled event is the $1,000,000 guaranteed Sunday Venom, which is priced at $2,650. This network caters more toward big, higher-stakes buy-ins and does not offer as many satellite chances for small-stakes players. Overall, the largest tournaments here have the highest guarantees regularly available to US players. Honorable mention goes to the Chico Network. They are growing their tournament schedule and now have roughly $1,000,000 per month in guaranteed events. While the tournament selection at this site is considerably less than the two above, the games are very soft. The largest tournament each week is a $50,000 guaranteed NLHE rebuy and addon event. You can read reviews on our two favorite Chico Network operators here for BetOnline and here for Sportsbetting.ag. The easiest cash games can be found on a combination of the biggest poker sites and the smallest poker sites: Ignition Poker, Sportsbetting.ag, and Grand Poker. The toughest games are on America's Cardroom. Intertops, SWC poker, and Nitrogen Sports are in the middle in terms of difficulty. All sites have regular no limit Hold'em and pot limit Omaha games running. If you are looking for more exotic games your options are pretty limited. 7 card stud players can find games on America's Cardroom. Omaha hi/lo players can find games on ACR, Sportsbetting.ag, and SWCPoker. The only site to offer HORSE is SWCPoker. Professional Rakeback always provides the maximum deposit bonus and rakeback deal that all of our partner sites allow to be offered to players. All you need to do to claim these bonuses and rakeback is to create an account using our sign up links below. To create an account on any of the poker sites mentioned above, you must first clear the cookies in your web browser - failure to follow this step could result in not being properly linked as a Professional Rakeback client, and thus, getting a substandard bonus and/or an account without rakeback, so be sure to follow this step!